The University of Waikato was founded in New Zealand in 1964. The school’s name originated from the splendor of the local landscape, “Waikato” in Māori signifying “running water”. The university is devoted to establishing a top-tier platform for education and research, providing comprehensive and creative teaching capacity and international education. Currently, the University of Waikato has international students representing more than 70 countries, who account for one-sixth of the total student population, as the university’s internationalization endeavors are unmistakable. 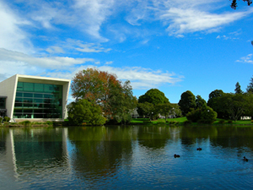 After more than 30 years of development, the University of Waikato has gained a unique position leading rival business and management schools in New Zealand. The Daily Telegraph praised the school as The Harvard Business School of the southern hemisphere. Moreover, the University of Waikato has also acquired accreditations from the AACSB, EQUIS, and AMBA.